It is interesting how Mexican and Indian Cuisine resemble in some ways. Take the basic tomato salsa, Indian cuisine has its version in the form of chutneys, either as a coarse or smooth paste. The first time I tasted salsa was in UK when I visited my sister. They had just been on a holiday to US and her husband brought back a huge bottle of salsa. Though I found it a bit vinegary, it tasted good with crisp (chips). Salsa is usually a tomato based sauce or dip with added ingredients like onion, garlic, cilantro and jalapeño. The sauce or tip can be mild to hot. The sauce or dip can be coarse or smooth. Depending on the dish its to be served with, the salsa can be uncooked or cooked. Usually, if its used as a dip its not cooked. However, if you’re serving it with enchiladas, burrito, chimichanga, flautas etc, it can be cooked. As I mentioned above ready made salsa are taste acidic because of the vinegar and also they have a lot of additives. I prefer to make my own sauces whenever possible as its difficult to get them in the supermarkets in Kenya. Even if they are available, they tend to be expensive. If I have to use salsa as a dip I like the uncooked one. I like to serve it with tortilla chips, chips (crisps), pita chips. Its a great starter for parties, TV meals, picnics or even as a snack. These days you’ll find a variety of salsas with added fruits but the basic remain the same…onion, garlic, jalpeno or chilis, lemon juice or good quality vinegar, cilantro. 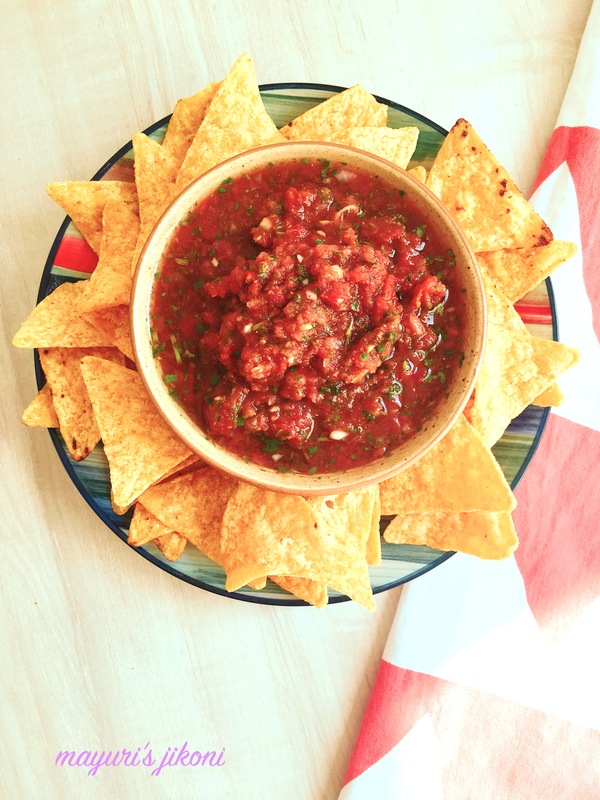 Today, I’m going to share with you the recipe for the basic tomato salsa. Since its difficult to find jalapeños in Kenya, I tend to use normal green chilis. To make fresh tomato puree, cut about 4 to 6 tomatoes into chunks. Put it in a pan with very little water. Let the tomatoes cook over low heat till they become soft. Puree in a blender. Sieve if you do not like the seeds and skin. Put tomato puree, chopped tomatoes, garlic, onion, green chilli and coriander in a blender. Process it just for a few seconds as you don’t want to puree the tomatoes and onion completely. Pour the salsa into a serving bowl. Add salt, pepper,sugar, lemon juice, cumin powder and red chilli powder. Mix well and serve. Can add about ½ cup of diced sweet red pepper if you like. Adjust the amount of chillis according to your taste. To make cumin powder, roast cumin seeds lightly in a pan. Grind it when it becomes cool.